"This delicious carrot cake cream cheese icing is a favourite family recipe of Harold and Joan Walker, egg farmers in Mt. Brydges, Ontario." Cake: Combine sugar, eggs, oil and vanilla in a large bowl; beat with an electric mixer until combined. Combine flour, baking soda, cinnamon and salt in a medium bowl. Add to liquid ingredients; beat until combined. Stir in pineapple, carrots, walnuts and raisins. 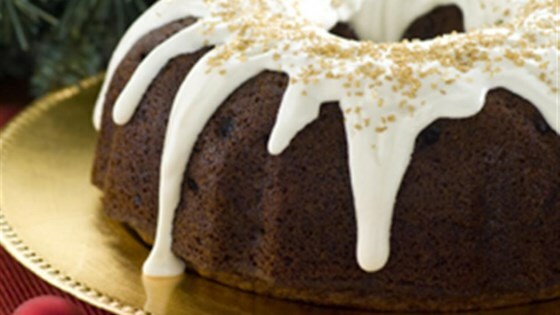 Pour batter into a greased 12-cup (3 L) Bundt pan or 13 x 9-inch (33 x 23 cm) baking pan. Bake in a preheated 350 degrees F (180 degrees C) oven until a cake tester inserted in the centre comes out clean (about 60 to 65 minutes for Bundt pan or 45 to 50 minutes for 13 x 9-inch (33 x 23 cm) baking pan). Let cake cool before icing. Icing: Combine cream cheese, butter, vanilla and icing sugar in a bowl. Beat with an electric mixer until smooth. Thin with a little milk, adding 1 tbsp for spreading or about 4 tbsp (60 mL) for drizzling over cake. This carrot cake is dense and delicious, a real crowd-pleaser. The cake tastes great. I wouldn’t make it in a bundt pan again as it was too moist and didnt come out of the pan easily. I had greased and floured the pan. The cake was very moist. I made the icing for a chocolate cake - it was great! Great cake! Only used one cup of oil and it was very moist. Also used gluten free flour and it came out perfect. I made it for a potluck. Received numerous compliments! Will make it again. I did not make any changes. I used gluten free all purpose flour and it came out very moist and no one noticed it was gluten free. This is my go to recipe for carrot cake and it always get demolished.